When considering large portions of the brain, we need to think about systems—not dichotomies. A system has inputs and outputs, and a set of constituent components that work together to produce appropriate outputs for particular inputs. A bicycle is a familiar system: The inputs are forces that push down on the pedals, slight movements of the rider’s body made in the act of balancing, and force that moves the handlebars. The components include the seat, the wheels, the handlebars, the pedals, the gears, the chain, and so forth. The outputs are the bike’s forward motion, keeping upright, and going in a specific direction, all at the same time. Crucially, the components are designed to work together to produce appropriate outputs for the system as a whole—for the entire bike. The same is true of the brain: It has different areas that do dif­ferent things, and the result of the brain areas’ working together is to produce appropriate outputs (such as your avoiding an object) for particular inputs (such as specific sights and sounds). For instance, if you see a car roaring toward you, you jump out of the way. The Theory of Cognitive Modes is based on organizing the brain into two major parts, top and bot­tom—each of which we will characterize as a large system that pro­cesses information in particular ways. As we show, we gain a lot by organizing the brain into these two large systems, noting how con­stituent parts work together. Let’s begin by being clear about what we mean by the top and bottom parts: Look at the diagram of a side view of the brain, which shows the cerebral cortex, the thin outer covering of the brain where most of the bodies of neurons reside. The cerebral cortex is where most cognitive activities arise—and we focus almost entirely on the cerebral cortex (not the “inner brain” structures that are located under the cortex, in the in­terior of the brain, and are involved in emotion and many automatic functions such as controlling arousal and hunger). 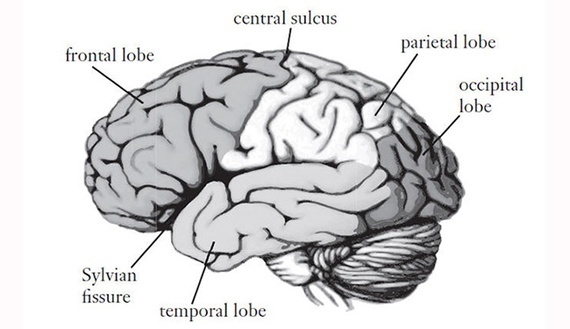 The diagram notes the locations of the four lobes of the brain— occipital, temporal, frontal, and parietal—and the location of the Sylvian fissure, a large, highly visible crease that roughly divides the brain into top and bottom parts. Each of the lobes implements many relatively specialized systems, but for our purposes it will be most useful to group the lobes into two large processing systems: The occipital and temporal lobes are in the bottom part of the brain, and the parietal and most of the frontal lobes are in the top part of the brain. A further neuroanatomical distinction must also be made: The frontal lobe itself can be divided into a top and bottom portion, based on how these portions are connected to the parietal and tem­poral lobes, respectively. Thus the brain neatly divides into a top and bottom part. The top and bottom portions of the brain have very different functions. This fact was first discovered in the context of visual perception, and it was supported in 1982 in a landmark report by National Medal of Science winner Mortimer Mishkin and Leslie G. Ungerleider, of the National Institute of Mental Health. This trail­blazing study, which went largely unnoticed in the popular culture, examined rhesus monkeys. Their brains process visual information in much the same way as the human brain. The scientists trained monkeys to perform two tasks. In the first task, the monkeys had to learn to recognize which of two shapes concealed a bit of food. The shapes were three-dimensional objects (such as a striped prismatic block) that concealed small cups, one of which contained a tasty morsel. The objects were shuffled randomly each time they were presented, but the same object covered the food every time, so the animals needed to learn to recognize it in order to find the food. In the second task, both objects were identical gray placards; both placards concealed small cups, one of which contained food. Now, a small cylindrical block was placed closer to whichever placard concealed the food. The location of the cylinder was shuffled randomly each time the choice was presented, so that it was closer to one of the placards than the other—but the food was always under the placard that was closest to the cylinder. The mon­keys needed to learn to recognize which placard was closest to the cylinder in order to find the food. In short, one task required learning to recognize shape, whereas the other required learning to recognize relative location. After each animal had mastered the two tasks, a part of its brain was surgically removed. Some animals had a portion of the bottom brain taken out (the lower part of the temporal lobe), whereas oth­ers had a portion of the top brain taken out (the rear part of the parietal lobe). The results of these operations were dramatic: The animals that had a portion of the bottom brain removed no lon­ger could do the shape task—and could not be taught to perform it again—but they could still perform the location task well. The animals that had a portion of the top brain removed had exactly the opposite problem: They could no longer do the location task, and could not relearn how to perform it—but they could still do the shape task well. Many later studies, including those that relied on using neu­roimaging to monitor activity in the human brain while people performed tasks analogous to the ones the monkeys had performed, have led to the same conclusion: Processing in the temporal lobe (located in the bottom brain) plays a crucial role in visual recogni­tion—the sense that we’ve seen an object before, that it’s familiar (I’ve seen that cat before)—whereas processing in the parietal lobe (in the top brain) plays a crucial role in allowing us to register spatial relations (One object is to the left side of the other). These functions occur relatively close to where neural connec­tions deliver inputs from the eyes and ears—but processing doesn’t just stop there. Rather, information about what an object is and where it is located flows to other brain areas, which do different things with that information. Researchers have shown that the top and bottom brain play specialized roles in functions as diverse as memory, attention, decision making, planning, and emotion. The bottom part of the brain is largely concerned with pro­cessing inputs from the senses and using them to activate the appropriate memories about relevant objects and events. For example, when you see a friend’s face in a sea of strangers, you recognize her face because the input from the eyes acts like a key that unlocks the memory of your friend. Once you’ve activated the relevant memories, you know things about the stimulus that are not apparent in what you see—such as that she likes cappuccino, has had a lot of experience work­ing in your industry, and often gives good advice. Knowing what you are seeing or hearing is sometimes an end in itself (such as when watching TV), but not often. Usually, we want to know what’s going on around us so that we can specify goals and figure out how to achieve them. For instance, you might decide to ask your friend to get together at a favorite coffeehouse to have a cup of cappuccino—and plan to ask her advice about a prob­lem you are having at work. Where do such plans come from, and how are they acted on? Devising and carrying out plans is the realm of the top-brain system. In particular, the top parts of the frontal lobe are concerned with these functions. But how does the top brain know what is being perceived? Information about where objects are located in space is so important for making plans that it is processed directly in the top brain; we need to know where objects are located in order to decide how to move them or how to move our bodies as we seek to approach or avoid them. (In our example, without such informa­tion, you couldn’t have known how to thread your way through the crowd to reach and talk to your friend.) But we need to know more than just where objects are located—we also need to know what they are. Such information from the bottom brain goes to the top brain, allowing the top brain to use information about the nature of ob­jects being perceived. The top part of the frontal lobe also contains numerous areas that control movements. Because our movements occur in our im­mediate environment, to program them appropriately our brains need to know where objects are located—to reach for them, step over them, run from them, and so forth. To walk over to your friend, you need to know where she is relative to your body; to talk to her, you need to know where she is facing, and you need to position yourself close enough (but not too close!) so that she can hear you easily. The top parts of our frontal lobe can take into account the confluence of information about “what’s out there,” our emo­tional reactions to it, and our goals. They then play a crucial role in allowing us to formulate plans, make decisions, and direct attention in particular ways (in part by connections to the parietal lobes); they allow us to figure out what to do, given our goals and our emotional reactions to the unfolding events that surround us. The bottom-brain system organizes signals from the senses, simultaneously comparing what is being perceived with all the in­formation previously stored in memory—and then uses the results of such comparisons to classify and interpret the object or event that gives rise to the input signals. The top-brain system uses information about the surrounding environment (in combination with other sorts of information, such as emotional reactions and need for food or drink) to figure out which goals to try to achieve. It actively formulates plans, generates expectations about what should happen when a plan is executed, and then—as the plan is being carried out—compares what is happening with what was expected, adjusting the plan accordingly (for example, by adjusting your grip as the phone starts to slip from your hand). Four distinct cognitive modes emerge from how the top-brain and bottom-brain systems can interact. The degree to which each of the brain systems is used spans a continuum, ranging from highly utilized to minimally utilized. Nevertheless, for our purposes it is useful to divide the continuum into “high” and “low” categories. Mover Mode results when the top- and bottom-brain systems are both highly utilized. When people think in this mode, they are inclined to make and act on plans (using the top-brain system) and to register the consequences of doing so (using the bottom-brain system), subsequently adjusting plans on the basis of feedback. Ac­cording to our theory, people who habitually rely on Mover Mode typically are most comfortable in positions that allow them to plan, act, and see the consequences of their actions. Perceiver Mode results when the bottom-brain system is highly utilized but the top-brain system is not. When people think in this mode, they use the bottom-brain system to try to make sense of what they perceive in depth; they interpret what they experience, put it in context, and try to understand the implications. However, by definition, people who are operating in Perceiver Mode do not often initiate detailed or complex plans. Stimulator Mode results when the top-brain system is highly uti­lized but the bottom-brain system is not. According to our theory, when people rely on Stimulator Mode they may be creative and original, but they do not always know when “enough is enough”—their actions can be disruptive, and they may not adjust their behav­ior appropriately. Adaptor Mode results when neither the top- nor the bottom-brain system is highly utilized. People who are thinking in this mode are not caught up in initiating plans, nor are they fully focused on classifying and interpreting what they experience. Instead, our theory predicts that they are open to becoming absorbed by local events and immediate imperatives. They should tend to be action-oriented, and responsive to ongoing situations. Each of us has a dominant mode, which is a distinctive feature of our personality—as characteristic and as cen­tral to our identity as our attitudes, beliefs, and emotional makeup. You can take a test on our website to find out which mode—Mover, Perceiver, Stimulator, Adaptor—best characterizes your dominant cognitive mode. However, our theory implies that we nevertheless sometimes adopt different modes in different contexts. Here’s a crucial point: The two systems always work together. You use the top brain to decide to walk over to talk to your friend only after you know who she is (courtesy of the bottom brain). And after talking to her, you formulate another plan, to enter the date and time in your calendar, and then you need to monitor what hap­pens (again using the bottom brain) as you try to carry out this plan (a top-brain activity). Moreover, the top-brain system prepares the bottom-brain system to classify expected objects and events, making that system work more efficiently. If you were expecting to see your friend in the crowd, this would actually be easier than noticing her without warning. The expectation (via the top brain) “primes” the recognition machinery in the bottom brain. The systems interact in various ways, however, the key hypothesis is that a person tends to use each of the two brain systems to a greater or lesser extent. We need to emphasize that all of us use each brain system every minute of our waking lives—we couldn’t function in the world without doing this. But we need to distinguish between two kinds of use: One kind is like using the brain for walking, which is largely dictated by the situation. If you see your friend and want to talk to her, you walk. The other kind is like using the brain for dancing, which is optional. You rarely, if ever, absolutely must dance. But you could learn to dance, and dancing might develop into a hobby—and you then might seize any opportunity to dance. When we speak of differences in the degree to which a person relies on the top-brain and bottom-brain systems, we are speaking of differences in this second kind of utilization, in the kind of processing that’s not simply dictated by a given situation. In this sense, you can rely on one or the other brain system to a greater or lesser degree. For example, you might typically rely on your bot­tom brain a good deal but your top brain a little less, yielding good observations but fewer complex and detailed plans. The degree to which you tend to use each system will affect your thoughts, feel­ings, and behavior in profound ways. The notion that each system can be more or less highly utilized, in this sense is the foundation of the Theory of Cognitive Modes. This post is adapted from Stephen M. Kosslyn and G. Wayne Miller's Top Brain, Bottom Brain: Surprising Insights into How You Think. Stephen M. Kosslyn is the founding dean of the Minerva Schools at the Keck Graduate Institute. He was previously the director of the Center for Advanced Study in the Behavioral Sciences at Stanford University. G. Wayne Miller is a staff writer at The Providence Journal.